ANNOUNCE HIS SALVATION DAY AFTER DAY! : HELP THE MONASTERY ACQUIRE A NEW SOUND SYSTEM! Each Midnight Mass of Christmas as we sing the responsorial psalm I ponder on how we, cloistered and separated from the world, take part in the great symphony that is the mission of the Order of Preachers: to preach the Gospel for the salvation of souls. We don’t preach from pulpits, teach in classrooms or proclaim the Good News in the many ways that our Dominican friars and sisters do and yet nonetheless, we are fully part of the preaching mission entrusted to St. Dominic and those who have followed his charism for over 800 years. Our monastery, at the corner of Morris and Springfield Avenue, is a “city set on a hill that cannot be hid”. Just by being here we preach the reality of God who sent His Only Son to save us just because He loves us so much! Even more, day after day, night after night, we praise, worship and adore the God who is all love by coming into His Presence seven times a day for Holy Mass and the Divine Office—the center of our life in the monastery. Throughout the day and night, we stand before God like Moses, like Esther. With rosary in hand and through the eyes and heart of Mary we plead for all the needs and intentions of the world, for those we love, for those for whom we promise and are bound to pray. As our voices rise up in praise we “proclaim to the nations God is King”! Throughout the years you have done much to support our life, providing for our material needs. We have experienced this most especially while we renovated our kitchen and monastic refectory. Now the time has come to provide for your needs as you come to Our Lady’s Shrine, sharing in the benefits of our monastery: Holy Mass, Eucharistic Adoration, and the Divine Office. In time we hope to be able to have a small gift shop and book store and adequate guest areas but right now high on our list is the Chapel Sound System! If you come to our monastery for Mass or for the Office sung throughout the day you know how bad the sound system is! 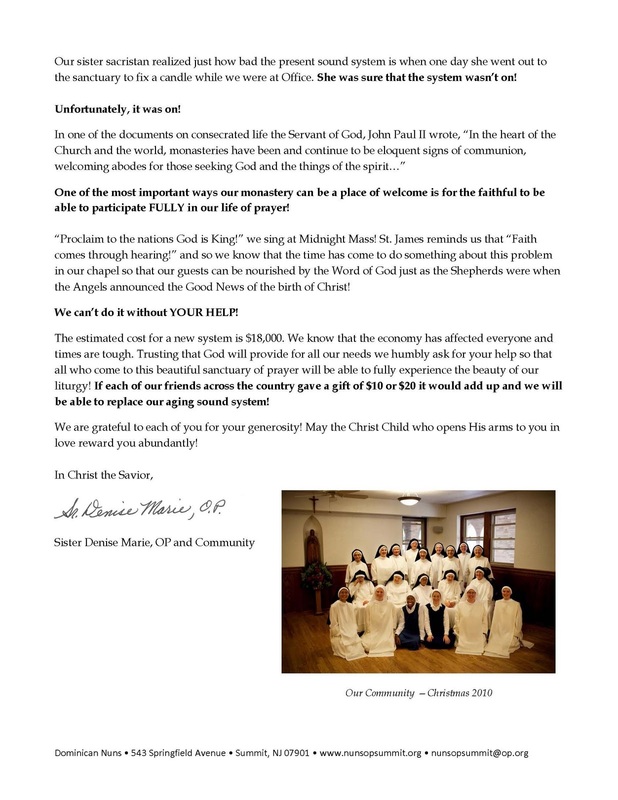 Recently we received several letters and emails revealing to us that some people will no longer come to our chapel for Mass. Why? “I couldn’t hear a thing!” was the reason! Our sister sacristan realized just how bad the present sound system is when one day she went out to the sanctuary to fix a candle while we were at Office. She was sure that the system wasn’t on! One of the most important ways our monastery can be a place of welcome is for the faithful to be able to participate FULLY in our life of prayer! “Proclaim to the nations God is King!” we sing at Midnight Mass! St. James reminds us that “Faith comes through hearing!” and so we know that the time has come to do something about this problem in our chapel so that our guests can be nourished by the Word of God just as the Shepherds were when the Angels announced the Good News of the birth of Christ! The estimated cost for a new system is $18,000. We know that the economy has affected everyone and times are tough. Trusting that God will provide for all our needs we humbly ask for your help so that all who come to this beautiful sanctuary of prayer will be able to fully experience the beauty of our liturgy! If each of our friends across the country gave a gift of $10 or $20 it would add up and we will be able to replace our aging sound system! We are grateful to each of you for your generosity! 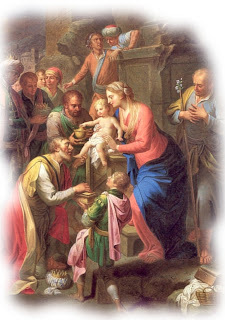 May the Christ Child who opens His arms to you in love reward you abundantly! We are offering a beautiful 2011 poster calendar at the Cloister Gift Shoppe here at the monastery and online. All proceeds will be used towards the purchase of a new sound system.